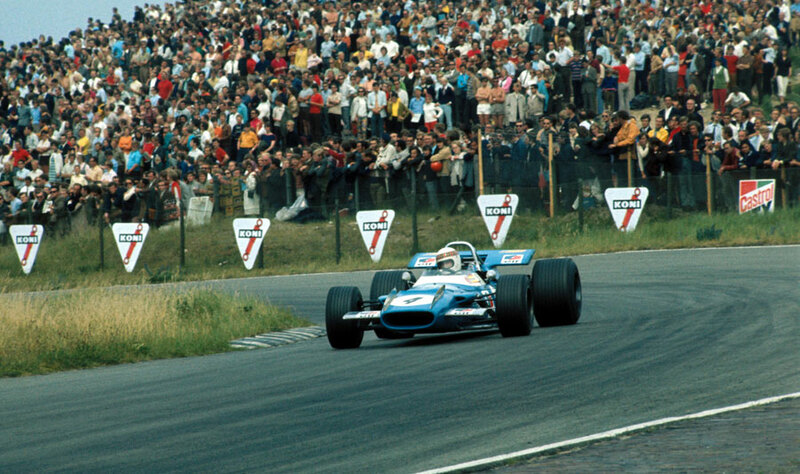 Jackie Stewart's third win in four races at the Dutch Grand Prix extended his lead in the drivers' championship, but as at Monaco five weeks earlier, much of the weekend was spent rowing over the cars themselves rather than the race. The wing regulations had been re-defined before Zandvoort and most of the cars appeared with fixed aerodynamic aids on their oil coolers and engine covers. Lotus tried the new 63s in qualifying but the wedge shaped four-wheel drive machines were put to one side when Jochen Rindt refused to drive them. He had the engine removed and put into the old Lotus and immediately proved his point by taking pole. Several teams had adapted the aerofoil wings in such a way they circumvented the FIA ban, and Lotus boss Colin Chapman had to dash back to England overnight after the first day of practice to have new wings made in time for the race. Even then, some rivals protested unsuccessfully the Lotus wings were illegal. Graham Hill led from the start but within two laps had been passed by Rindt and Stewart, and it stayed that way until the 17th lap when Rindt's engine died as he passed the pits and his Lotus coasted to a stop at the Tarzan Corner. From then on Stewart's blue Matra was unchallenged with Jo Siffert giving chase, but the battle for third kept the crowd entertained as Denny Hulme, Chris Amon, Jacky Ickx and Jack Brabham tussled relentlessly. This contest brought them within sight of Siffert, and Amon spurted clear near the end to take the other podium place. Hill, who had been dogged by handling problems, was seventh. While Stewart's win had set him up for a strong run at the championship, there was no question that the Rindt/Lotus combination had a great deal of potential.